Clouds (megham) are symbolically associated with the emotional states of the mind, physical states of the world and the circumstances related to life. Dark ominous clouds portray trouble, chaos, and the onset of difficult times. Blue clouds suggest the divine power at work. White clouds are the messengers of peace, hope, and love. In Meghadootam, an ancient play by Kalidasa, the hero of the play seeks the assistance of a cloud to convey his love to his beloved who like him is also lonely. Clouds are thus swans of the celestial sphere in the mid-region flying from one place to another. They connect people who are separated by space and distance, carrying good tidings from one to another. As the substratum of the heavens, they have an ethereal and divine quality whch the Vedas proclaim. Indra is the lord of the skies, who flashes his weapon, the lightning, standing amidst dark water bearing clouds. According to the legends he released the rain held in captive by Vrita, the demon of dark clouds. The clouds represent the mental turbulence that often clogs the minds of humans. In Hindu spirituality clouds represent the impurities that cover intelligence (buddhi) and delude beings. Just as they cover the sun and the moon and prevent their light reaching the earth, the impurities cover the intelligence and prevent its light reaching the mind. Clouds also symbolize the transience life and the phenomenal world. They create the illusion of activity in the placid sky, as they morph into numerous forms before they dissolve into rain or disappear from the sky. In the literature, clouds represent a world that is detached and different from ours. Living in the clouds, or having one's head in the clouds means living in a world of fantasy or becoming detached from the reality of earthly life. A clouded mind portends delusion, sorrow, afflictions, or stormy period. In the Yogasutras (4.29), the highest state of self-absorption is called "dharma megha samadhi," meaning the state of self-absorption in which consciousness acts like a cloud that rains virtue and righteousness (dharma) and frees the mind from all turbulence and afflictions. The sound of thunder (megha garjana) symbolically represents the power and the voice of God (devagarjna). In the Brihadaranyaka Upanishad, thunder represents the heavenly voice of Brahma and utters "da" "da" and "da" reminding the gods, humans and demons to practice restraint (dama), charity (dana), and compassion (daya) respectively. Indra is the god of the skies and declares his presence with thunder. Thunder also represents anger and ferocity, an awakening call, lound noises, and the march of elephants and soldiers in the battlefield. In the Vedas Indra is described as the god who wields thunderbolt as his weapon (vajrayudham) and slays the enemies with it. With his thunderbolt he strikes the demons hidden in the dark clouds and releases the water which is held in captivity by them. In the Kena Upanishad (4.4), the flash lightning (vidyuth) is compared to the knowledge of Brahman. When it descends into the human mind like lightning, it results in instantaneous inner awakening and self-realization. 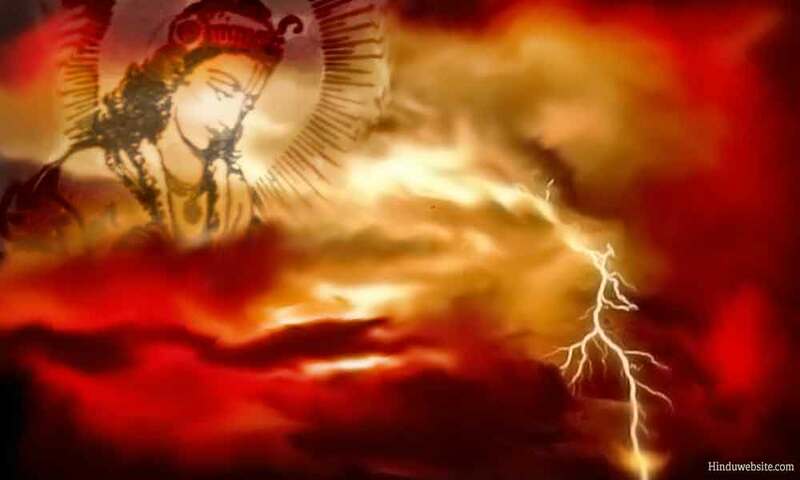 However, a lightning strike (vidyuthghatham) may convey the wrath of gods, especially of Indra, since it results in instantaneous death or burning of the body. Symbolically it also represents divine communication or any sudden intuitive awareness or opening of the mind.